For decades, the UK government has been very careful in ensuring a low-risk status for its public and private debt. This column warns that if the UK opts to leave the EU, uncertainty over the implications of Brexit would put this low-risk status in jeopardy. A depreciation of the pound could well generate an export boom, but this would not compensate for the damage to internal demand and to the UK’s ability to access external financing of its deficits. Ahead of the EU referendum in the UK, the pound has been falling markedly. The high volatility and relative weakness of the pound may not come to an end on June 23. If the UK opts to leave the EU, persistent uncertainty over what Brexit actually means is likely to produce much more of the same for quite a long time. A prolonged period of uncertainty would be unavoidable, because there are many areas in which the EU and the UK are strictly interrelated (trade, finance, energy, environment, border security, defence, and so on). As policymakers try to sort out the post-Brexit regime, many tables would have to be re-opened at once, both multilaterally and bilaterally. Every table would create opportunities for disagreement and numerous unexpected issues may arise. Every issue would create policy conflict and political games, resulting in delays and amplifying uncertainty about the final outcome. While some studies warn against the costs and risks of a currency ‘collapse’ in this environment, many observers are more optimistic and stress a potential benefit for the UK. If financial markets attribute a higher risk to pound-denominated UK assets, so the argument goes, the pound will depreciate and remain weak. This will increase external demand, which in turn will stabilise economic activity and sustain employment. This argument finds some support in a paper by Paul Krugman (2014). While Krugman stresses the benefits of exchange rate flexibility in the face of a confidence crisis, he also finds that country risk may actually be expansionary – the worse the risk prospects, the deeper the fall of a currency, the larger the market gains in the foreign markets. A key assumption in his analysis is that the country borrows in own currency – which happens to be satisfied in the case of the UK. Based on related work (Corsetti et al. 2016), we argue that things are not that simple. A hike in country risk can hardly be welcomed as a good thing. As the periphery of the Eurozone has amply demonstrated, country risk means that the government, firms and households in a country suffer from deteriorating borrowing conditions. While net exports expand, internal demand suffers. Fiscal policy becomes more costly and politically difficult to resort to, as markets may show little or no tolerance for widening deficits. A first line of defence is monetary policy. In this respect, however, it matters whether the central bank has room to respond to risk shocks with expansionary cuts in interest rates. A monetary expansion permits the exchange rate to depreciate and stimulates net exports. At the same time, it ameliorates more directly the borrowing conditions faced by domestic residents in the financial markets. Together, these effects help to sustain internal demand. The scenario is not far from what happened in the UK in the first years of the Global Crisis. Today, however, policy rates are at the zero lower bound. Monetary policy may still respond, relying for example on forward guidance, quantitative easing, and credit policies. All these can ease macroeconomic and financial conditions, and induce a depreciation of the currency. But they are unlikely to be as effective as conventional interest rate policy. At the zero lower bound, more depends on the exchange rate and the external conditions. Let’s focus on the possibility that that the country is hit by an adverse shock to risk premia charged by markets on its residents’ debt. What are the effects on the domestic economy? We address this question, relying on the model put forward in Corsetti et al. (2016). The model is a standard New Keynesian model, augmented with a sovereign risk channel such that borrowing conditions of the private sector deteriorate with those of the sovereign. As a result, the private and public sector spreads are positively correlated – capturing volatility in country risk. Figure 1 shows simulation results. The dashed lines represent the case when monetary policy is unconstrained. Solid lines correspond to the case when policy rates may not be adjusted during the period when the risk shock hits the economy. This represents, in a stylised way, the scenario of a binding zero lower bound constraint. In the first case, the impact of the shock is less adverse. 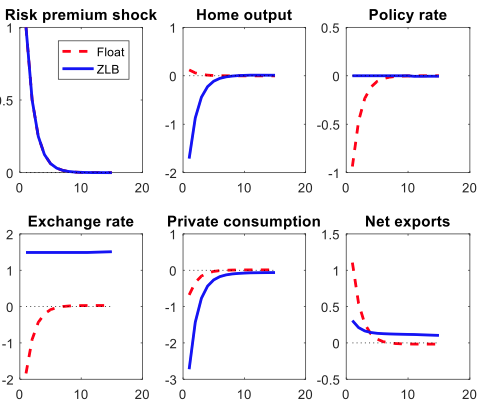 Indeed, as monetary policy can respond to shock with sufficient vigour (the interest rate falls decisively), the risk premium causes a large depreciation, boosts net exports, and leads to a small output expansion. Private consumption nonetheless falls. Yet the scenario is quite different if there is no space for monetary accommodation (the blue solid lines). In the model, the contraction in internal demand is so strong that inflation turns negative, the exchange rate actually appreciates, and there is a large recession (see also Cook and Devereux 2103). To be fair, one may envisage a model where the exchange rate may actually respond more to the risk shock, attenuating the fall in output. In this case, on impact, the economy will lie somewhere between the red dashed and the blue solid lines. But it is hard to argue that, with a constrained monetary policy, the exchange rate per se could undo the damage created by the contraction in internal demand. For decades, the UK government has been very careful in maintaining and ensuring a low-risk status for its public and private debt. During the Global Crisis, this strategy enabled the country to attract copious amounts of financing and foreign direct investment, vis-à-vis large and persistent trade and current account deficits. A collapse of the pound in response to a hike in country risk may well generate an export boom. But this would be cold comfort, relative to the damage that may result from the implications of country risk for internal demand, and more generally for its ability to access external financing of its deficits. Krugman, P. (2014) “Currency Regimes, Capital Flows, and Crises”, IMF Economic Review 62(4), 470-493.